I think we can all agree that fries are one of the greatest foods ever invented. The variety these days is astounding - crinkle cut, waffle cut, shoestring, steak, sweet potato, curly, seasoned…don’t even get me started on poutine! My favorite is a crisp shoestring fry, fluffy on the inside and perfectly salty; dipped in ketchup with tons of cracked black pepper. I don’t know about you, but I can eat way more fries in one sitting than I’d care to divulge. With the big fight coming up, sometimes we’re looking for healthier alternatives for entertaining. It’s not easy to replicate the gloriousness of the french fry, but I have something delicious and just as tasty for you. Enter the avocado. Avocados provide nearly 20 essential nutrients, including fiber, potassium, Vitamin E, B-vitamins, and folic acid. They’re also naturally sodium and cholesterol free, making it a good fat! - Preheat your oven to 450F. Line a baking sheet with parchment or a wire rack and set aside. - Slice avocados lengthwise, removing the pits. Each halve should yield 4-6 fries, depending on the size of your avocado. I like to slice them with the skin ON for this recipe, since it makes them easier to handle at first. Totally up to you! I also find that it’s easier than using a spoon to try to scoop out the entire flesh in a clean motion. The fries come out cleaner when you slice them with the skin on. - Peel off the skins and get your fries ready for an assembly line! - Season the slices lightly with salt and pepper. - Mix your panko, melted butter, garlic powder, onion powder, paprika, salt, and pepper. - Set up three bowls in an assembly line. In the first bowl, place the ½ cup of flour and season with salt and pepper. Crack the eggs into the middle bowl and beat them lightly. - Add the panko mixture to the last bowl. 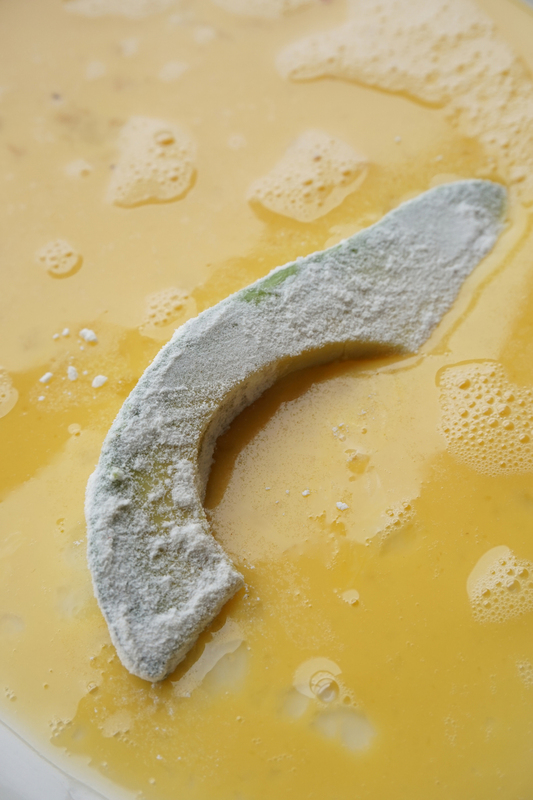 - Dredge each avocado slice in the flour. - Next, the beaten egg, and finally coat them in the seasoned panko and place them on the wire rack or parchment paper. - Finish coating all the fries. - Bake for 20-25 minutes, until the panko is nicely browned. - Meanwhile, mix up your Chipotle Lime Cream! Take an 8 oz container of Sour Cream and mix 1 tsp (or more to taste) of chipotle peppers (love this one that comes in adobo sauce), mixed with the juice of one lime. Add ½ tsp garlic powder and you’re ready to go! 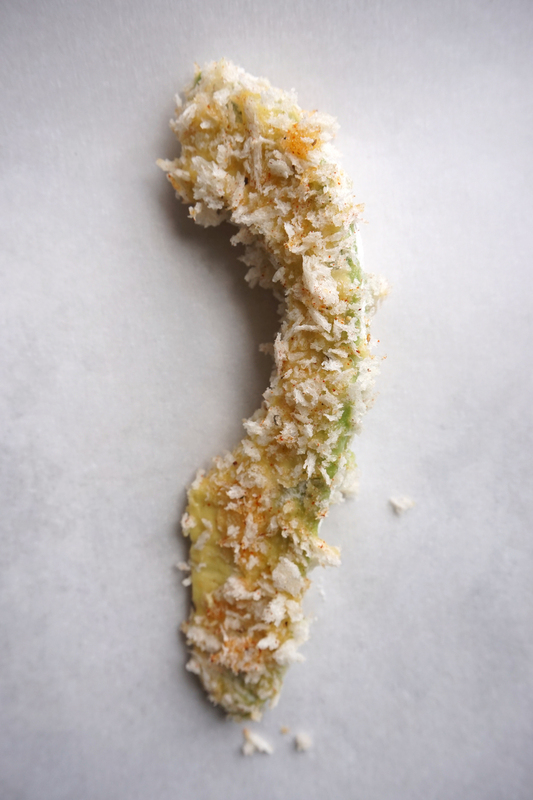 You can’t beat a crispy avocado fry! Have fun with these - whether for an event like the big fight, or just another night at home lol! Have an amazing week!